Make this special bracelet to celebrate the start of Literacy/Bee Week and gift it up for your BFF! 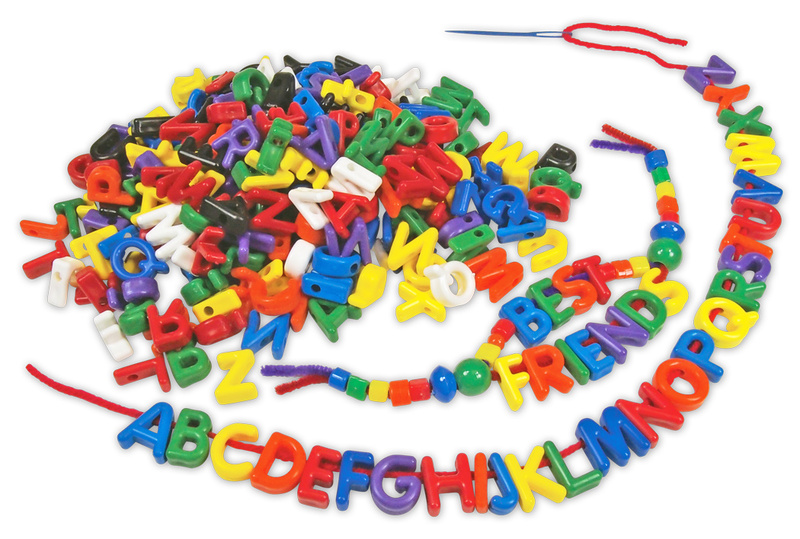 Learn to string letters together to make words and develop fine motor skills! We’re excited for the Scripps National Spelling Bee to begin! It begins on May 26-June 1, 2013 according to the official Scripps National Spelling Bee website, which you can find HERE! Help students learn to spell fun phrases for their friends to read while practicing their letter comprehension, vocabulary and phonological skills. As you can see above, I’ve created a bracelet and matching necklace. Start with the chenille stem. Wrap it around your wrist or your neck to get the right length for the jewelry. Cut the stem where needed. For the necklace, you’ll only need one length to string the letters onto. The bracelet requires two chenille strands, so you’ll need to cut a second chenille stem at the same length. Twist one end of the bracelet or necklace to keep the beads in place as you thread them in. String 5 R2195 Little Shape Beads and a R2170 Brilliant Bead onto the knotted end of the chenille stem. For the bracelet, you’ll need to string the beads through both stems together. Once you get to this point, separate the stems and thread the bottom stem with the letters that spell the word “FRIENDS.” You’ll have more space on the top stem so flank the word “BEST” on either side with a few R2195 Little Shape Beads. Once you have spelled out the two words, join the two stems together and repeat the same pattern of beads that you arranged at the start of the bracelet. Finish off with a knot. You can use the R5601 Lacing Needles to help string the beads through the chenille stems! I’d love to see some of your kids’ creations! Send us photos of what they’ve made to us! Contact us through the contact form. This entry was posted in Crafts, Language Arts and tagged bee week crafts, best friends forever bracelet, kids crafts, letter and number bead crafts, letter beads, literacy week crafts, manuscript bead crafts by roylcoblog. Bookmark the permalink.